Seemingly with lots of time on her hands and little else of worth to do, the confuddled racist at the centre of the feigned piety and false outrage, Renae Maihi, drummed up a petition seeking the revocation of Bob’s knighthood. Signed by some 68,000 people, the petition was delivered to Parliament in March 2018. Well, now that’s over, 1Law4All has a suggestion for a further petition project by Renae Maihi. 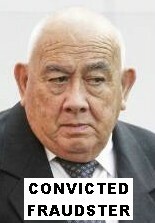 With the same gusto, enthusiasm and sense of self-righteous outrage, organise a petition to remove the blighthood of convicted part-Maori fraudster, Sir Ngatata Love. Sir Ngatata Love’s plea to be spared jail was rejected after the High Court saw no sign of remorse from the disgraced part-Maori leader, when Justice Graham Lang sentenced Love to two-and-a-half years in prison. Love, knighted for services to part-Maori, had been found guilty of defrauding his iwi. He also maintains the honorary title of emeritus professor for his former role as head of the Victoria University of Wellington business school. The university has not yet commented on whether Love should forfeit that title. Given an eminent opportunity to display blind justice equality, including calls from one of those who was the victim of Love’s fraud, Love’s fraud-against-the-bros insult and injury has been ignored by selectively perverse petitioner Renae Maihi. After all, it was only a few million dollars (robbed from “my people”) involved. As in, nothing compared to a bit of briefly-appearing digital satire. A beneficiary of the Wellington Tenths Trust, Tuffy Churton, said Love should now be stripped of his knighthood. “What that knighthood represents now, is basically that he was knighted for defrauding us, out of our settlement, as beneficiaries of the Wellington Tenths Trust,” Churton said. Remember, it’s not racist when any part-Maoris do it! And no. We’re not holding our breath for the start of Renae Maihi’s new petition!